the life of a wife: Dry Skin Be Gone! The sunflower oil is to add a smooth texture and help carry the scents of the essential oils. Sunflower oil is odorless, which is perfect. I got mine at an all natural foods store, which is where I also got my essential oil. This is the brand of essential oils that I like, but really any will do. You can use just one or mix any that you like. I already had peppermint (I put it on my neck when I have migraines) so I just bought some grapefruit and combined them. Peppermint is the "cooling" oil and grapefruit is "joyful". Perfect combo! To make the body scrub, just combine the two cups of sugar cane with 1 cup of sunflower oil. When it's well combined, add one drop of essential oil at a time. You should add the less-intense oil first, and then the more intense one. You could just ask at the store or look up the oils you choose. (Peppermint is more intense than grapefruit if you're using this combination.) I think I ended up adding 3-4 drops of each in one batch. You can see how strong you want the scent your scrub to be. Then I added a couple of drops of pink food coloring until it was the shade that I wanted. 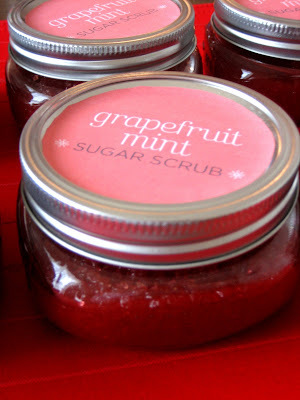 Then I bought cute jars at the hardware store and spooned my scrub into them, and finished it off with a label. I doubled the above and I filled 8 jars. I gave them to some of my girlfriends as Christmas gifts! And I kept one for myself. I keep it in the half-bath by the kitchen, and I like to use it on my hands after I'm done washing dishes. (side note: I wouldn't recommend scrubbing your face with this stuff, the sugar can be a little rough for your poor facial pores.) Your skin will be so much happier after you use this stuff! And the scents of the essential oils will really help relax you. Enjoy! and i loved it! i just used my scrub the other day, and it makes my hands so soft! so nice compared to the sand paper my skin is usually like right now. it will be even more helpful when i start work and am constantly having to work my hands! wow! that's awesome! ps I love your blog! !